Hematopoietic stem cells (HSCs) inherently possess self-renewal activity and multi-lineage differentiation potential. Consequently, human HSCs continuously supply all types of mature hematopoietic cells throughout life. We previously discovered CD34-negative (CD34−) hematopoietic stem cells (HSCs) in human cord blood (CB) . The gene expression profiles and differentiation potential of these CD34− HSCs clearly differ from those of CD34-positive (CD34+) HSCs . Moreover, CD34− HSCs can generate CD34+ HSCs in vitro and in vivo . Thus, these two CD34+ and CD34− HSCs were thought to represent a different class of primitive HSCs in the human HSC hierarchy . The online version of this article ( https://doi.org/10.1007/s12015-019-09884-5) contains supplementary material, which is available to authorized users. 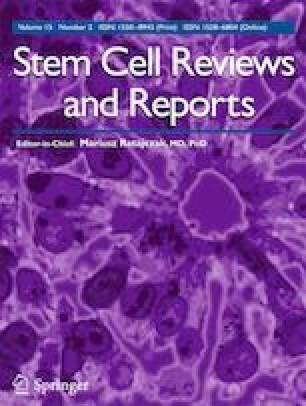 The authors are grateful to the Japanese Red Cross Kinki Cord Blood Bank for providing the CB samples used in this study. The authors also thank Kyowa Hakko Kirin Company (Tokyo, Japan) for providing the various growth factors used in this study. This work was supported by Grants-in-Aid for Scientific Research C (Grant No. 24591432) from the Ministry of Education, Culture, Sports, Science and Technology (MEXT) of Japan; a grant from the Strategic Research Base Development program for Private Universities from the MEXT; the MEXT-Supported Program for the Strategic Research Foundation at Private Universities; a grant from the Terumo Life Science Foundation and a grant from SENSHIN Medical Research Foundation. Y. M., conceived the study and designed the experiments, provided study material, performed the experiments, collected and/or assembled data, performed the data analysis and interpreted the results, and wrote the manuscript; K.S., provided study material, performed the experiments, collected and/or assembled data; Y. S., was involved in the conception and design, directed the project, provided financial and administrative support, participated in the data analysis and in the interpretation of the results, wrote the manuscript and gave final approval. All procedures performed in studies involving animals were in accordance with the ethical standards of the Animal Care Committees of Kansai Medical University (#18–085).